​A common misconception about court reporters is that they just type really fast on normal keyboards. 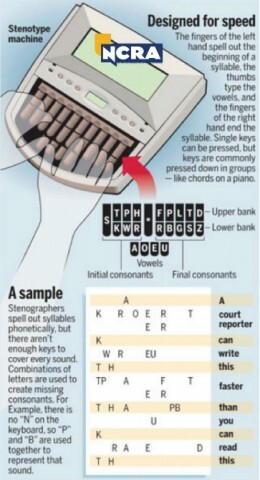 This is false, court reporting is done on a stenotype (or stenograph) machine which has special shorthand keys that a court reporter must learn how to use in court reporting school – Many compare it to learning a whole new language. Listed below are 3 steps that attorneys can take to ensure that a court reporter is able to deliver the transcript in as little time as possible. This week is Court Reporting and Captioning week. Consider participating by spreading the word about this interesting and profitable career. ​Many will be surprised to learn that not every state is able to provide court reporters for civil litigants in court proceedings. California’s budget continues to prevent them from providing this service.